Career-wise, the Finn brothers have been a musical tour de force. From early days together in Tim's band Split Enz, to later days reunited in Neil's band Crowded House, and beyond to individual solo releases, there have been stellar moments both in songwriting and performance. Oddly enough, it wasn't until 1989 that the brothers actually entertained the idea of collaborating. They started writing songs together for a project that never happened, and many of those songs wound up on Crowded House's releases Woodface and Together Alone. The next mutual side project was a hasty collaboration recorded in the space of four weeks and released in 1995 (in 1996 for the U.S.) as Finn. Though that release had some commercial aspects, it featured songs that largely explored exotic and tribal instrumental sounds (played mostly by the brothers) in moody ways. Now, after a volley of multiple solo releases, the brothers have reunited for a project that is more deliberate and fully realized, reflecting more of a band sound. That's good news for fans of both Crowded House and Split Enz, because Everyone Is Here manages to further the brothers' musical legacy with twelve more good songs. Back are the delicate harmonies that seem to come naturally for this brother team, and a sense that the competition between them has inspired better music all around. The CD leads with "Won't Give In", the most commercial track and obvious choice for single. This contemplative song about promises made, family ties, and returning to the fold could fit well into the Crowded House canon. Neil mans the guitars, Tim the piano and additional percussion, while Matt Chamberlain drums and Sebastian Steinberg plays bass. "Nothing Wrong With You" is another sweet gem, a mid-tempo number that lauds one who is better than the treatment the world affords him/her and surrounds it with an infectious melody: "We've learned to take abuse / From devils we don't know / People who have lost all heart / Look for someone else to blame / You just keep on walking when they call you a dirty name". A trio of producers lend a hand with this track: Mitchell Froom (who produced this record along with a number of Crowded House albums) adds additional piano, Jon Brion adds some drum and percussion fills (Chamberlain and Pete Thomas handle drums), and Tony Visconti aids the brothers with the string arrangement. The Matt Chamberlain beat and handclaps drive the energetic "Anything Can Happen". Here Jon Brion adds some additional guitar, and Davey Farragher helms the bass in a song that reflects an attitude of forging on, coming 'round, gathering up, and giving in. While I first thought the love song "Luckiest Man Alive" was a bit saccharine on the lyrical end, it's a real grower musically. This out-and-out tribute to the woman he loves features a chorus of headline-type proclamations: "Man finds love in his life / He's the luckiest man alive / Someone true by his side / He's the luckiest man alive / She cut right through his foolish pride / He's the luckiest man alive". Another contender for a single release would be "Homesick". Here you get a real sense of collaboration, yin and yang in the form of Tim and Neil harmonizing together as only they can. The yearning is captured in a thickly produced musical environment full of Tony Visconti-arranged strings, piano and organ from Froom and Brion, and pedal steel and lap steel from B.J. Cole and Neil Watson respectively. Visconti lends some lovely mandolin touches (along with double bass and cello) to the delicious brotherly reminisce of "Disembodied Voices". Here Neil and Tim think back to talking after the lights are out from their bedrooms down the hall some 40 years ago in Te Awamutu, New Zealand. "A Life Between Us" is a wonderful musical exploration of brotherhood, a study in friendship, watching over each other, yet retaining plenty of mystery through the years as their relationship evolves. There are some wonderful passages here, such as "We're staring at each other / Like the banks of a river / And we can't get any closer / But we form a life between us". But it's not all deliberation and seriousness here. Witness the philosophical fun of the more upbeat "All God's Children", wherein heavy contemplation gets the tongue-in-cheekiness treatment as ultimately, love conquers all: "We're all God's children / And God is a woman but we still don't know who the father is". "Edible Flowers" is a more somber piano and strings-driven ballad about mortality and the wish to survive "to see another birthday". This one's a bit heavy-handed lyrically for my tastes: yes, sure, we're all getting older and we shouldn't let the moment pass. Still, the Finn Brothers can create a beautiful song out of just about anything. "All the Colours" is a short, tuneful reminisce about a particular goodbye and how it takes a while to gather up and carry on beyond it. "Part of Me Part of You" is another strong, equal vocal harmony song (think along the lines of "Chocolate Cake"), a paean to their roots in New Zealand as well as to their ongoing dream of a musical career. The CD closes with the syncopated rhythms of "Gentle Hum", sounding like something off one of Neil's solo CDs. Neil plays the piano here (and takes the main vocals), accompanied by Jon Brion's percussion loops and the soft accordion of James Crabb. The song is about the vibrations that will make us all one, and the sentiments are reflective, optimistic, and well intentioned. It provides a sweet coda for what really is a superb collection of songs. 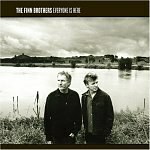 Like many a Crowded House release, this new Finn Brothers album gains resonance with repeated listens, revealing subtle charms and musical accents over time. Everyone Is Here is a fairly sedate affair, reflecting the maturity of songwriters who realize there's more to the craft than merely rocking out. Froom's production is simple and effective (and aided by the contributions of Brion and Visconti), capturing the sense of a live band, even in the studio. Adam Kasper did a fine job of recording and Bob Clearmountain added his magic in the mixing room (joining Froom for the first time since Woodface). While I still love certain songs from individual Neil and Tim solo efforts, this is a much more even collection overall than any of those, perhaps a direct result of the brothers pushing each other that extra bit to create better music. All told, these dozen songs are a cause for celebration for fans of Crowded House, Split Enz, and music in general - Everyone Is Here delivers the kind of Finn Brothers album that people have long been awaiting.